Windows comes with several commands that help you diagnose network issues. But, one of the more useful commands available to you is the TRACERT command. TRACERT is a command line tool that will show the different hops a packet will take as it reaches its destination. You can type TRACERT followed by an IP address or a URL and you will get a report back as the packet passes through each router on its way to the destination. This tool is good to help you check the path that is taken to see if there is any issues with the path between you and the destination. In addition to showing you each router the packet passes through, it will also let you know how long it took to get to each hop. Furthermore, it will also let you know if the packet is not able to reach the destination and which router the packet failed to travel through. Say you are unable to get to a specific website the command will show you where the packet failed. If the packet fails before it reaches your internal router, then you know there is an issue between your computer and your router. This would mean there is an issue inside your network. But, if the packet fails after it leaves your router, then there is an issue beyond your control. 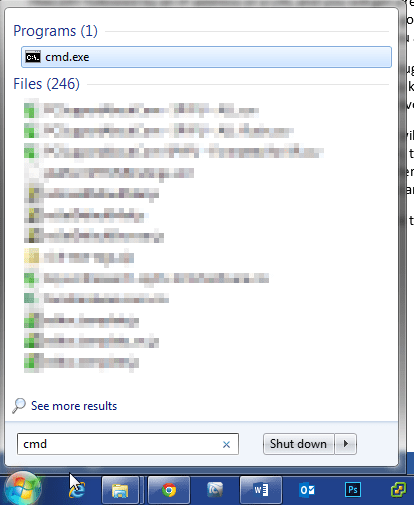 To run the command, click on the Start button and type cmd in the run box. Then hit the <ENTER> button to open the command window. When the command line opens, type in cmd followed by an IP address or domain name. In the example below we are running a trace from our home to popular DNS servers 4.2.2.1. There are times where you will get a time out between the source and the destination. This is usually because the router it passes through is set to now pass back information. This is for security purposes. But, if the packet never reached a final destination it will help you check where the errors starting happening. In this example, you will see that it does reach a final destination passing through 7 routers after leaving ours. There are some other switches available with the command. 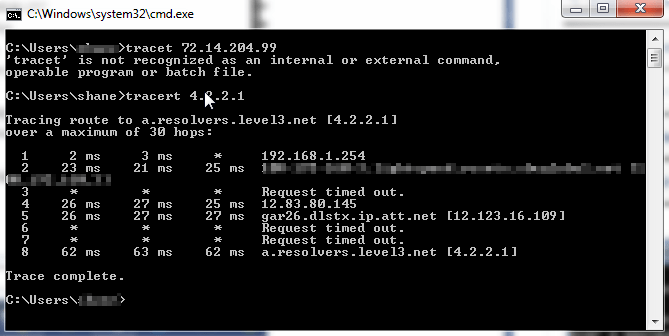 For example, you can do tracert -4 <ip address> to show only IPv4 addresses. This is handy if it is showing IPv6 information. If you want to see all the switches, you can use tracert -? to show all the different switches available with the command. If you have an operating system other than Windows, there are many TRACERT utilities available for download. TRACERT is a useful command to kepe in your bag of tricks when troubleshooting network issues. This command combined with other commands like PING, NSLOOKUP, etc can help narrow down issues you are facing in your network.